Upstate Door Company is a full-service loading dock equipment parts, service, and installation company. First, we provide the highest quality products for new installation for you to select from. From rolling service doors, rolling fire doors, dock seals, to safety truck restraints, we’ve got your covered with any loading dock equipment need your company has. What is a Dock Seal? Dock seals are barriers between the dock and the truck trailers that protect your building from the environment during loading and unloading. They are weather-resistant and durable enough to compress when trailers press against them, and return to their original shape after the truck leaves. It’s important to make sure you have the proper size dock seal bumpers and that they are installed correctly for safe operation. What is a Dock Shelter? A dock shelter is a canopy that goes over and around a door to keep your crew covered while loading and unloading. They are designed to keep your employees safe from slips, falls, and weather which increases your overall efficiency. But they have to work great to help your business thrive. Because of this, our dock shelters are made from high-quality materials that are resistant to wear and tear. What is a Dock Pit Leveler? A pit leveler is designed to be the connector between your loading dock and the trailer or truck. They are also referred to as dock lifts and can be operated through a variety of mechanisms. There are dock levelers with springs, hydraulic operation, and airbag lifts. We cover and carry a full range of dock pit levelers to give your business the dependability and service you need to be successful. 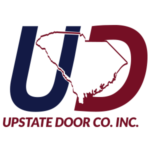 When you work with Upstate Door Company, you work with a company that is dedicated to service and fulfilling your unique needs. We aren’t a one time sale. We form lasting partnerships with customers to make sure you receive long-term solutions for all of your loading dock equipment needs.